This is the kind of regional recipe that really needs to hit it big nationwide. 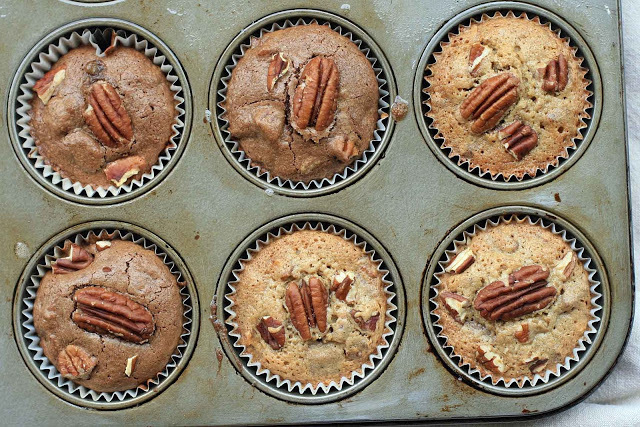 I saw it in two Southern cookbooks and you could tell both authors were big fans of these muffins… these were no cookbook filler. And there’s good reason: they’re quick, the ingredient list is short, and they taste amazing. 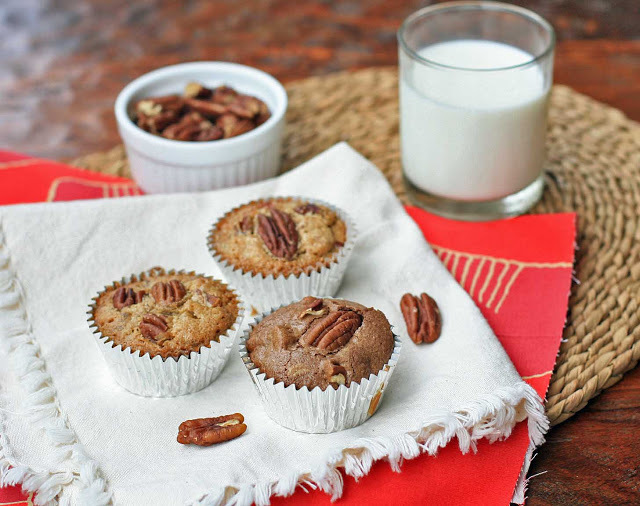 Imagine rich, dense cake with the flavor of pecan pie without the time or hassle. You could conceivably be eating these in just over 30 minutes. Yes, they’re that quick and easy. A friend who tasted these claimed they reminded him of Caramel Cuts, a chewy pecan blondie that they served at Punahou School (for any other Punahou alums or Obama fans out there). Since I’m a big fan of chocolate pecan pie, I also did a chocolate version that ended up tasting like a killer fudgy pecan brownie. I really like the fact that you can make these in such small portions too. You could even cut the recipe in half… although why would you want to? In fact, you might want to think about doubling this one. Preheat oven to 350 degrees and line a muffin pan with 9 baking cups. Coat with cooking spray. 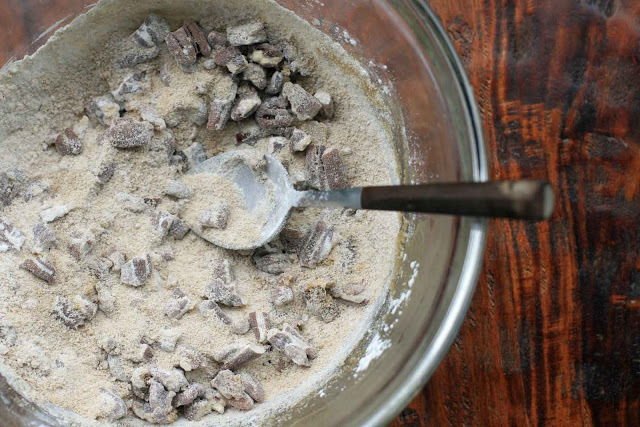 In a large bowl, combine the chopped pecans, brown sugar, rice flour, sorghum flour, sweet rice flour, and xantham gum. Set aside. In a separate bowl, beat the eggs until foamy. If you’re making the chocolate version, place the chocolate chips in the melted butter and let stand for a minute or two. Stir until the chocolate is melted and the mixture is smooth. 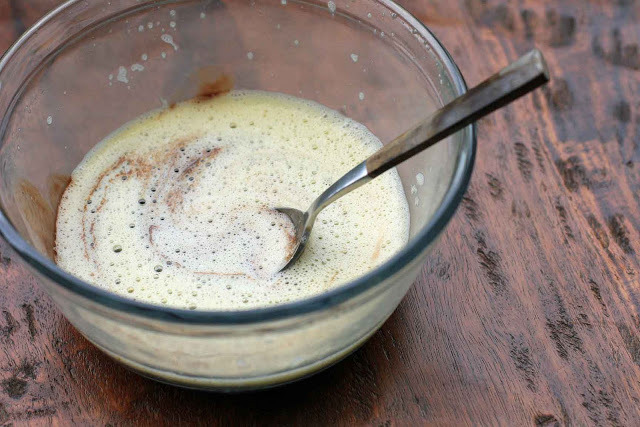 Add the butter (and chocolate, if using) to the eggs and stir quickly to combine. Add the egg and butter mixture to the pecan mixture and stir just until combined. 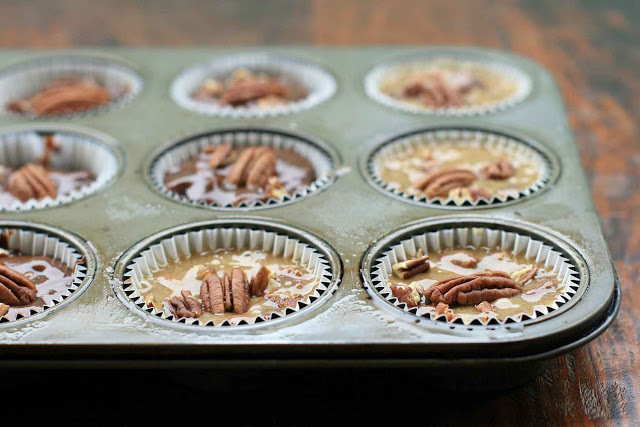 Spoon the batter into the baking cups and place one pecan half in the center of each cup. Bake for approximately 20-25 minutes, or until a toothpick inserted in the center comes out clean. Remove from pans immediately and let cool on a cooling rack. Serve at room temperature or chilled (my preference).